One of the most popular wedding favours at the moment are miniature bottles of wine. This is an especially good choice for wine connoisseurs or weddings that are held at a vineyard venue. Keep these five tips in mind if you are thinking about using wine wedding favours. If you’re looking for wine wedding favours, you may want to choose a combination of red and white as many guests will have a strong preference for one or the other. You would give white wine to the female guests and red wine to the males. You could also arrange a collection of bottles at the exit to your reception venue and let guests pick for themselves. If your wedding reception is organised at a vineyard venue it shouldn’t be difficult to find a significant wine wedding favour; you can just use one that is produced on site. Other ways to make your wine favour meaningful is to use the wines that have been served with your wedding meal or to pick the wine that the two of your drank on your first date or your first holiday together. Many companies offer customised labels for your wine favours, and you can add your names, the wedding date, and even a photo of the two of you on the wine bottle. Although this is a good idea, you may find companies that specialise in personalised wine wedding favours do tend to be quite pricey, and you may have fewer choices in wine types. If you’re on a budget buy your wine bottles wholesale and just tie a handmade label around the neck of the bottle with a personal message to each guest. You can give guests ideas about when to drink the wine or what to eat with it. 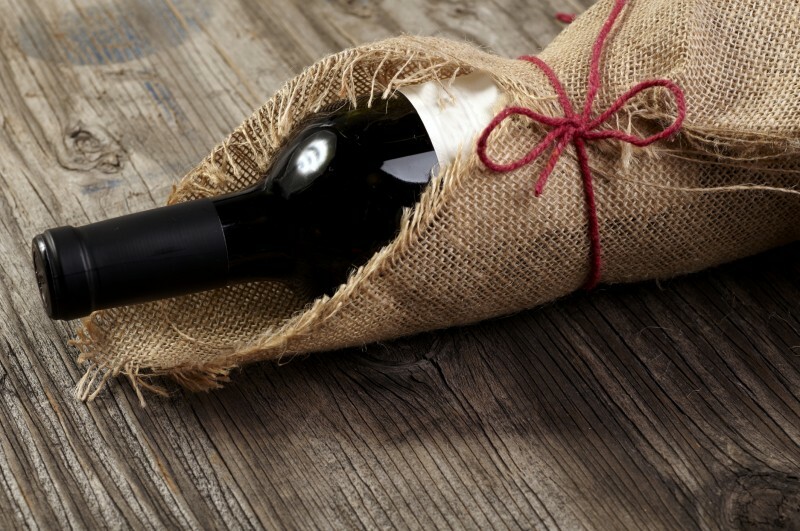 While the wine bottle itself is a decorative feature, you could still think about including some sort of wrapper or container or guests might think they are meant to drink the wine favours with their meal. Cellophane wrap with a decorative ribbon is a stylish and affordable choice, and a wooden case filled with shredded paper is a classic alternative. You can always include chocolates that work with your wine, but if you have room in your budget, it might be better to opt for a higher quality wine instead. Not all wedding venues will allow you to hand out wine bottles at your wedding, so check this before you purchase the favours. If your venue won’t allow alcoholic favours, you can always keep the wine theme and give novelty wine bottle stoppers, a short guide to wine, or a beautiful wine bottle holder instead.